A discussion of therapeutic strategies for chronic type B aortic dissection, avoiding expansion of the false lumen, and treatment with endovascular therapy. It has been 23 years since we started practicing thoracic endovascular aortic repair (TEVAR) for the treatment of Stanford type B aortic dissection. In 1998, we reported that closing the entry site by stent grafts within 6 months from the onset of type B dissection was associated with better clinical outcomes, leading to reduced size of the false lumen.1 However, in the real-world clinical practice, TEVAR is not always performed in a timely manner, and it is often done after an aneurysm is formed in the false lumen. In such cases of a dissecting aneurysm, TEVAR may not be effective in leading to regression of the false lumen.2 Open surgery, on the other hand, inevitably requires replacement of the extended thoracoabdominal aorta with a prosthetic graft, because the dissecting aneurysm is often enlarged and straddles the thoracoabdominal segment. The intercostal and lumbar arteries often remain patent, as a result, the steal phenomenon is likely to occur during the open surgery, resulting in increased incidence of paraplegia. Consequently, in the treatment of type B aortic dissection, therapeutic intervention after expansion of the false lumen could yield a poor outcome and encounter greater difficulty. In this article, we first present two clinical cases and then discuss therapeutic strategies for chronic type B aortic dissection, by which expansion of the false lumen can be avoided, and in cases in which it occurs, patients can be treated by endovascular therapy. A patient developed acute type B aortic dissection 2 months before referral to our hospital. He had no major complications during the acute phase and received antihypertensive treatment with a β-blocker. We considered that an early intervention by TEVAR was indicated in this case and performed two debranching procedures (right axillary-left carotid/left axillary artery bypass) plus TEVAR (Figure 1). The surgery consisted of the bypass (two debranching procedures) followed by implantation of a Cook Zenith TX2 distal extension (diameter: 26 mm; length: 80 mm) in the descending aorta through a unilateral femoral artery, subsequent implantation of a Zenith TX2 tapered main body graft (diameter: 36–32 mm; length: 147 mm) in a piled-up manner from zone 1/aortic arch to the descending aorta, and an ensuing entry closure just distal to the left subclavian artery. 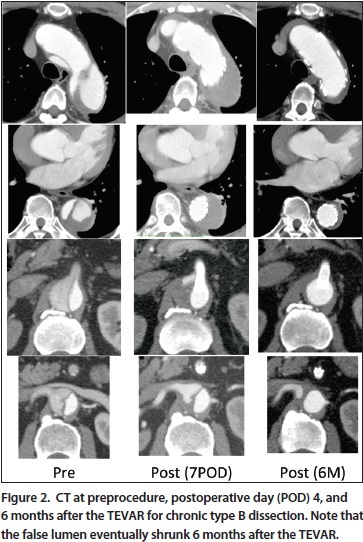 A contrast-enhanced CT scan performed 4 days after TEVAR showed extensive thrombosis of the false lumen. A CT scan after 6 months showed that the thrombosed false lumen seen at the acute phase of treatment had eventually regressed (Figure 2). 3. The patient has hereditary or possibly hereditary aortic dissection, and an entry site is patent in the thoracic region. A patient with CBAD in the second year after the onset of dissection was referred to our hospital for emergency care because of a rupture of an infrarenal abdominal aortic aneurysm at the distal end of a false lumen (Figure 3A). As false lumens of the descending and thoracoabdominal aorta were already enlarged, we judged that all dissected aortas should be treated. The primary entry tear was located in the distal arch. The other entries were also patent, one at the thoracic descending aorta, one immediately superior to the celiac artery, and one at the left renal artery bifurcation. The reentry was found in the thrombosed infrarenal abdominal aorta, which constituted the distal end of the false lumen. At the visceral arteries level, the celiac artery, the superior mesenteric artery, and the right renal artery originated from the true lumen, whereas the left renal artery branched from the false lumen. Because the abdominal aortic aneurysm in the distal end of the false lumen had ruptured, emergency replacement of the abdominal aorta with a prosthetic graft was carried out. For the left renal artery branching from the false lumen, subsequent reconstruction was deemed difficult, so a bypass surgery from the prosthetic graft was performed (Figure 3B). The proximal part of the aortic dissection was anastomosed so that a double-barrel aorta was maintained. Twenty-one days after this emergency abdominal surgery, the patient underwent a debranching procedure (left carotid-left subclavian artery bypass) plus TEVAR (implantation of a Zenith TX2 distal extension [diameter: 22 mm] in the descending aorta and a subsequent insertion of a Zenith TX2 tapered main body graft [diameter: 34–38 mm] in a piled-up manner from zone 2 to the descending aorta) in order to close the primary entry at the distal arch (Figure 3C). 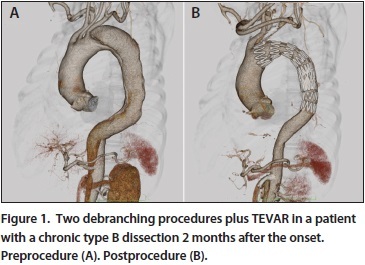 Fifty-five days later, fenestrated endovascular aortic repair (FEVAR) was carried out on the thoracoabdominal aorta using a Cook custom-made device (Figure 3D). Consequently, all entry and reentry tears in this case were successfully closed, and the false lumen in the entire region of the dissected aorta was thrombosed. 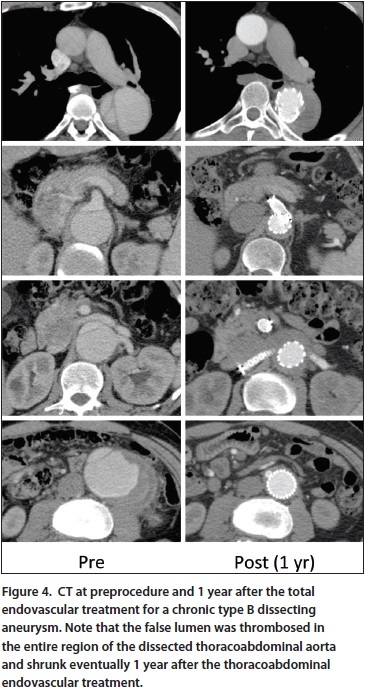 CT scans 1 year after the thoracoabdominal endovascular repair showed shrinkage of the thrombosed false lumen (Figure 4). We previously investigated changes in the false lumen diameter and aortic diameter by following patients who had false lumen enlargement ≥ 6 months after the onset of dissection and underwent closure of the primary entry tear by TEVAR alone.2 We found that the percentage of patients who had shrinkage of the false lumen was small (38.9% had ≥ 5-mm shrinkage of the aortic diameter at the maximum diameter site in the thoracic aorta). Moreover, when the lesion was extended into the thoracoabdominal aorta, patients were more likely to have enlargement of the false lumen (46% had ≥ 5-mm expansion of the aortic diameter at the site immediately superior to the celiac artery). Therefore, in patients such as the present case, who had enlargement of a false lumen involving the thoracoabdominal aorta with several entries and reentries, we considered that closure of the primary entry tear alone would not lead to regression of the false lumen, and thus, closure of all entry and reentry tears should be undertaken. Eventually, stent grafts need to be placed extensively from the distal arch down to the abdominal aorta and the iliac artery level. Major problems associated with such endovascular treatment include how to treat visceral arteries and the risk of spinal cord injury (SCI). 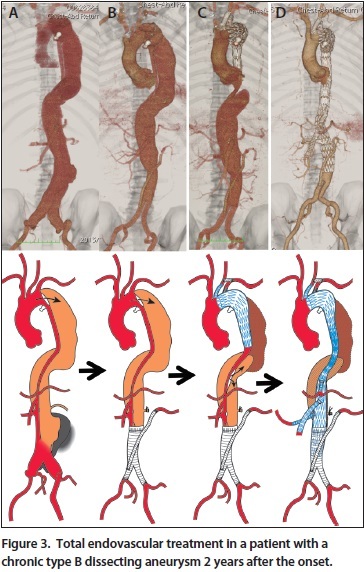 We have overcome these problems by adopting hybrid thoracoabdominal endovascular aortic repair (hybrid TAEVAR) since 19974 and FEVAR since 20105 for revascularization of visceral arteries. In hybrid TAEVAR, reverse bypass surgery is performed from the abdominal aorta, iliac artery, or prosthetic abdominal aortic graft to visceral arteries (celiac, superior mesenteric artery, and bilateral renal arteries). After the revascularization, a stent graft is inserted from the thoracic descending aorta into the true lumen of the abdominal aorta/iliac arteries so that entry and reentry tears can be closed in the entire region of dissection. This operative procedure involves a major open abdominal surgery and a long retrograde bypass, so there is a concern that a sudden occlusion, intestinal adhesion, fistel formation, and infection may occur. FEVAR, on the other hand, is a procedure to reconstruct visceral arteries using Cook’s custom-made device; a small-caliber stent graft such as Atrium Advanta (Maquet Vascular Systems) or Fluency (Bard Peripheral Vascular, Inc.) is inserted into visceral arteries via a fenestration that is designed according to the anatomy of individual patients’ arteries. Compared to a total endovascular repair for the treatment of a true thoracoabdominal aortic aneurysm, this procedure for aortic dissection has the disadvantage of being extremely technically difficult in that the compressed true lumen allows only a narrow working space for branch reconstruction and in that branching of a false lumen and dissection of branches per se may occasionally be involved. 1. During planning, the aim is to minimize the extent of the intercostal and lumbar arteries covered with the endovascular graft. a. The treatment region covers ≥ 4 segments of the intercostal and/or lumbar artery between thoracic vertebra (T) 8 and lumbar vertebra (L) 1.
b. The treatment region covers 3 segments of the intercostal and/or lumbar artery between T8 and L1, and the patient has had previous aortic surgery and/or malperfusion in the subclavian artery or internal iliac artery. 3. Preoperative or intraoperative reconstruction of the internal iliac artery and/or subclavian artery is to be performed, if possible, for any potential stenosis. 4. A statin is administered preoperatively for ≥ 1 week (since 2011). 5. Opioid use is avoided on the day of the TEVAR and in the early postoperative period. 6. Mean systemic blood pressure in the intraoperative and immediate postoperative period is strictly maintained at ≥ 80 mm Hg. 7. The time required for intraoperative malperfusion of the iliac, femoral, and subclavian arteries, particularly for the internal iliac arteries, is minimized. 8. Bypass surgery and TEVAR, as well as each TEVAR are done separately, as much as possible. With introduction of hybrid TAEVAR, FEVAR, and prevention measures against SCI, it is now possible to close all entry and reentry tears in patients with CBAD who have had expansion of the false lumen. Consequently, complete thrombosis and subsequent regression of the false lumen can be achieved. In other words, use of those measures is invaluable in the treatment of CBAD with an expanded false lumen. In the treatment of CBAD, it is important to perform TEVAR to close the primary entry tear within 6 months from the onset of dissection when there is a possibility that a false lumen may be expanding. In patients who were not indicated for early TEVAR and consequently had false lumen expansion, all entry and reentry tears should be closed individually. The percentage of patients with CBAD indicated for TEVAR in the total aortic dissection, including treatment for postoperative type A dissection, is estimated to be approximately 30% to 40%, constituting a growing field of TEVAR. Establishment of clearly defined therapeutic indications and treatment goals is essential to reduce futile medical interventions and the incidence of complications. Masaaki Kato, MD, is with the Department of Cardiovascular Surgery, Morinomiya Hospital, in Osaka, Japan. He has disclosed that he receives research grants from Medtronic, Japan Lifeline Co., Ltd.; serves as an advisor and has received speaker fees, and/or consulting fees from Cook Japan, Inc.; and serves as an advisor to Japan Gore Inc., Junken Medical Co., Ltd.
1. Kato M, Matsuda T, Kaneko M, et al. Outcomes of stent-graft treatment of false lumen in aortic dissection. Circulation. 1998;98(19 suppl):II305-11; discussion II311-2. 2. Kato M, Kuratani T. The history and current status of thoracic endovascular aneurysm repair in Japan. J Cardiovasc Surg (Torino). 2008;49:503-510. 3. Kato M, Bai H, Sato K, et al. Determining surgical indications for acute type B dissection based on enlargement of aortic diameter during the chronic phase. Circulation. 1995;92(9 suppl):II107-12. 4. Kuratani T, Kato M, Shirakawa Y, et al. Long-term results of hybrid endovascular repair for thoraco-abdominal aortic aneurysms. Eur J Cardiothorac Surg. 2010;38:299-304. 5. Kato M, Motoki M, Isaji T, et al. Spinal cord injury after endovascular treatment for thoracoabdominal aneurysm or dissection. Eur J Cardiothorac Surg. 2015;48:571-577.